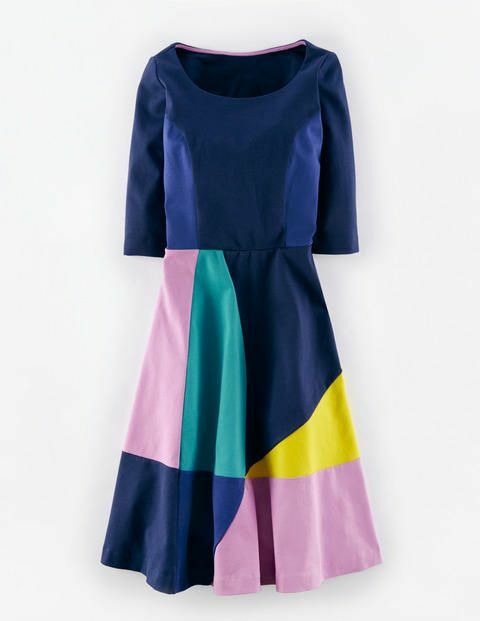 I instantly was drawn to the colorblocking in the large scale geometric shapes and the easy-wearing silhouette. Fabric magicked its way into my stash after I found this dress, but some of these initial fabrics were not the right colors I was looking for. I bought the same green ponte twice from two different places. “Coral” turned out to be neon orange and “soft yellow” turned out to be more like a school bus that got hosed down with a mustard cannon (Buy swatches people. Ugly fabric is forever). So this project got shelved until a pretty piece of salmon ponte came into my stash via Fabric Mart. Can salmon save a colorblocking disaster? It sure did for this Winter Street Geometric Dress! Winter Street Geometric Dress Mash up! The colors that I chose for this dress really remind me of a taffy shop. I always enjoyed seeing salt water taffy being made when I was a kid (more so than eating it), and the bright springy colors are just the sort that make me happy. All of the fabrics are ponte, and the colors are salmon, white, spring green, and a light spring blue. The primary yellow I got by dyeing pieces of the white fabric with Rit DyeMore in daffodil. 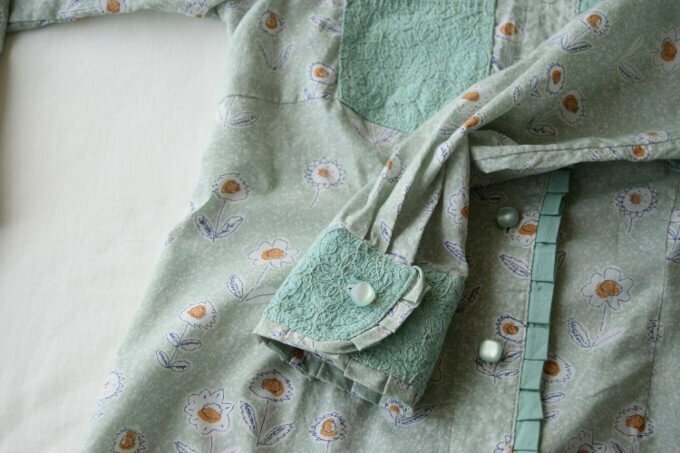 Patternreview’s Winter Street Dress: I love the bodice on this pattern. It’s a nice easy scoopneck, and the waist seam hits me at a good spot. I used this pattern before as my day dress for the Day and Night Dress Challenge. A shortened version of the patterns’ sleeve was used. I would’ve used the skirt, but I didn’t want the pleats in the skirt that are in this particular pattern. There was concern that the colorblocked sections would be interrupted too much by the pleats. 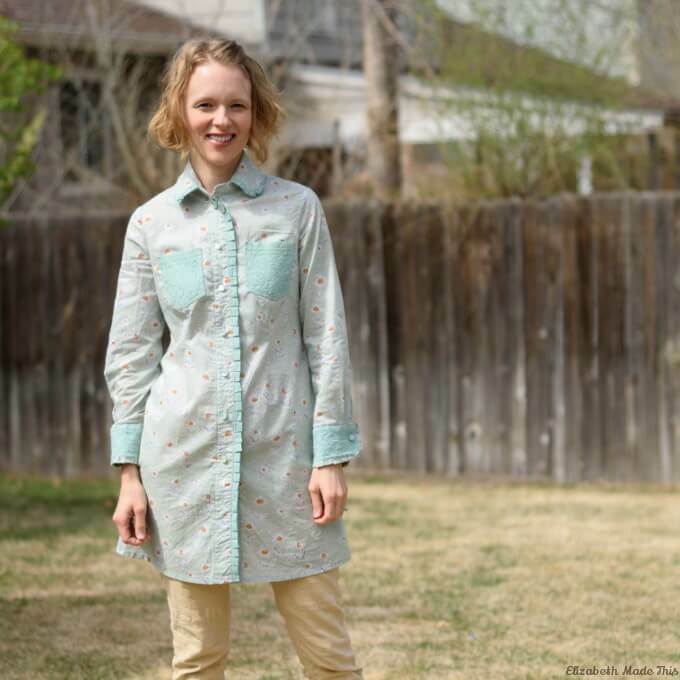 Blank Slate Patterns’ Denver Tunic: I like the princess seams on this particular pattern. With my Day and Night Dress Challenge Winter Street, I used the Denver as a template for some embroidery work. On this project, I used the front side panels as actual pattern pieces. Jalie’s Bella Dress/Tilly and the Buttons Coco: Well, I started out using the skirt from the side panels fused on top of Tilly and the Button’s Coco dress. The Bella flares out dramatically on this pattern. Ultimately the ponte did not have enough drape to handle the flare, so I draped out the side seams to make a more A-line skirt. The final skirt is closer to the original Coco dress skirt in shape, though it’s not quite as wide. In addition to the above pattern pieces, I added back side panels. Using a French curve, I drew a line where a back side panel would approximately lie. 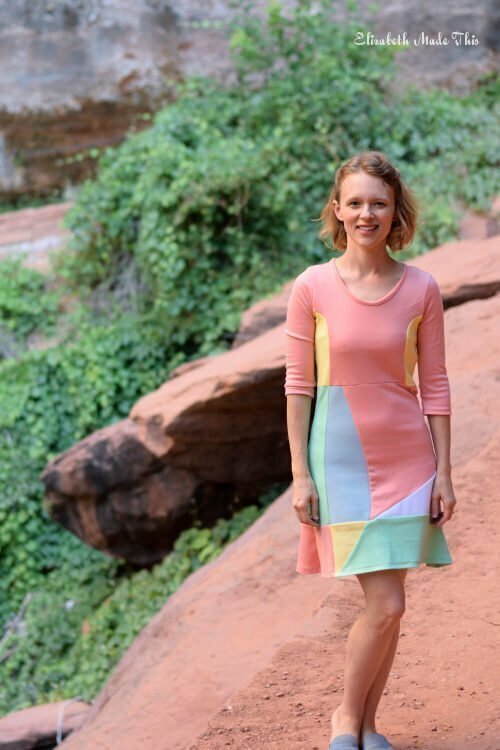 To make the colorblocking, first I drew lines all over my skirt to emulate the shapes in the inspiration dress using a regular ruler and also a French curve. To save a little time, I cut right on these lines and added seam allowances to the appropriate places on my actual fabric. Then, to keep myself honest, I labeled the pieces with “up” on the top edges and with a “+” on every edge that needed a seam allowance added. Next, I numbered all of the seam intersections so that I would put the puzzle together in the right way. The skirt back is a mirror of the front which makes for some cool side seam intersections. All of the many intersections took some careful sewing to get the points right, and overall, I’m pretty pleased with how things came together. 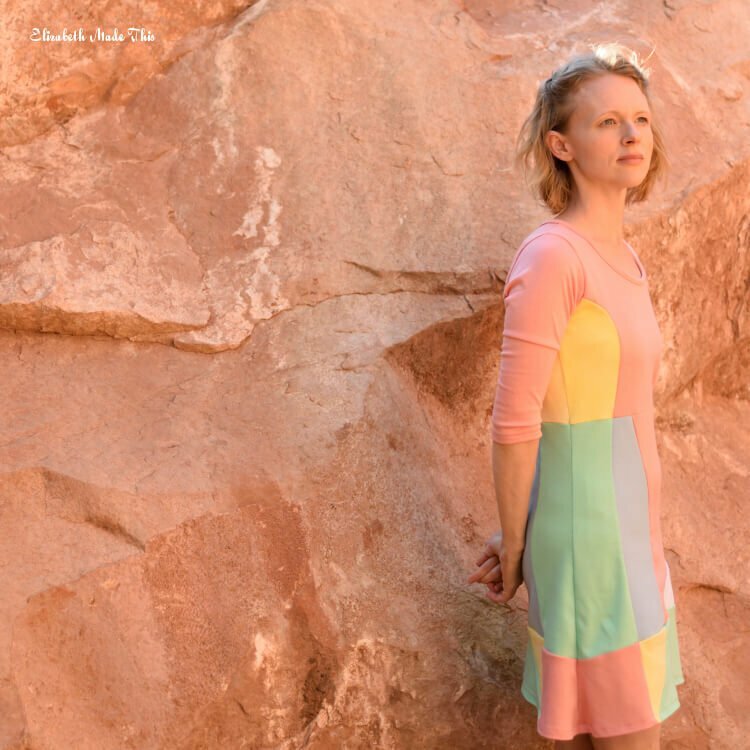 My backdrops for this dress are in Zion National Park. I thought it’d be a little awkward wearing a ponte dress in the middle of the woods, yet it turned out to be quite the comfortable getup in the early morning. No doubt if my family and I had gone out late in the day when we first got to the park the previous day, it would’ve been awful. In fact, by afternoon it was well over 100 degrees! In the morning, it was closer to 70 in the woods which was lovely. I’m looking forward to wearing this one in the cool of fall with some leggings and boots! Overall, I’m really pleased that I finally tackled this project that was on my must do list! Recently, Melissa challenged me to a round of Who Made It Best. 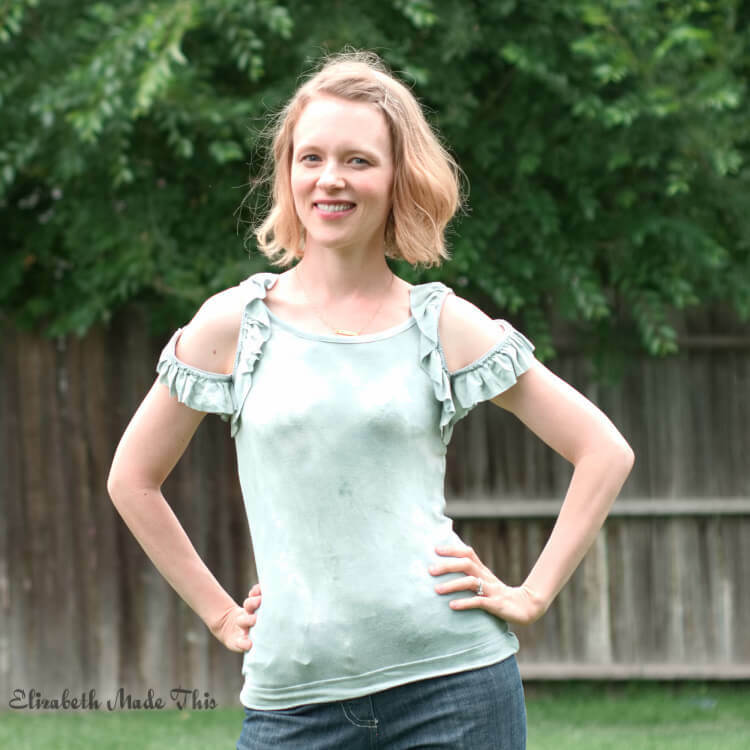 For this challenge, I’m making this zippered ruffle hack of Straight Stitch Design‘s Greenwood Tank. Who Made It Best is a friendly challenge hosted by Melissa of mahlicadesigns where she pairs up with a fellow blogger and they sew the same pattern to see Who Made It Best. The challenge rules are simple: 1. We agree on a pattern to use 2. Sew it up to suit our personal styles 3. Share it and ask you to vote for your favorite. You can check out Melissa’s version of her Greenwood here. For this tank, I used this pistachio/white tie-dye rayon lycra from Fabric Mart. This stuff was amazing to work with. It’s opaque, it has incredible recovery, and it gathered beautifully for the ruffles. 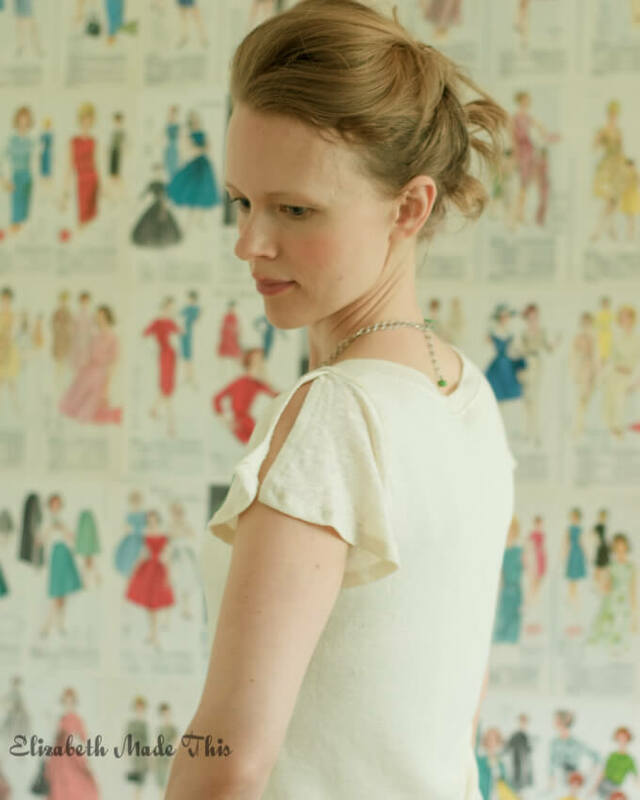 Do you stalk RTW sites like I do looking for sewing inspiration? It seems I’m always on the hunt for cool design details that can be incorporated into my next project. When I saw Philip Lim’s Zipper Detail Ruffle Top, I knew I wanted to hack it. Net a Porter describes it thus: “3.1 Phillip Lim’s off-white top has zip-embellished white ruffles that can be unfastened to create a cool cutout effect. ” So zipped up, it’s a frilly girly tank. Unzipped, it turns into an edgy cold shoulder look. Pretty cool, eh? I’m working on editing a 3 part video to show the construction process of the zipper cutout, but I’ll break down in this post the changes to the pattern that needed to happen first. For the zipper ruffle to work, it needs to be on a wider shoulder than what’s available on the Greenwood Tank. I could’ve saved time by starting with a tank pattern that already had a wider shoulder (on my video, I’ll share several options), but I’m playing by the rules here and using Greenwood! To widen it, I overlaid my TNT t-shirt pattern’s shoulder. I determined that I wanted the shoulder to be about 2″. I slid the edge of the t-shirt pattern out to meet that 2″ mark and traced the armscye. It helped that I had previously altered the Greenwood to have the same armscye as my TNT t-shirt for fit reasons. You want to do this on the front and the back. 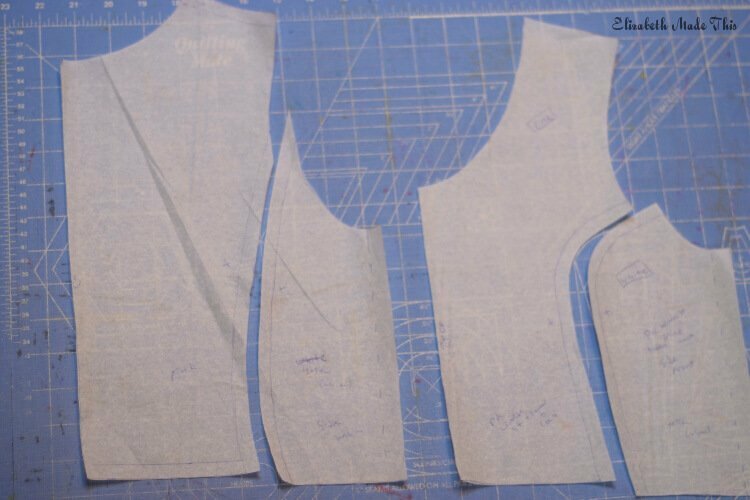 After you widen the shoulder, draw a line 1″ away from the raw edge of the armhole. This is where the zipper is going to sit. 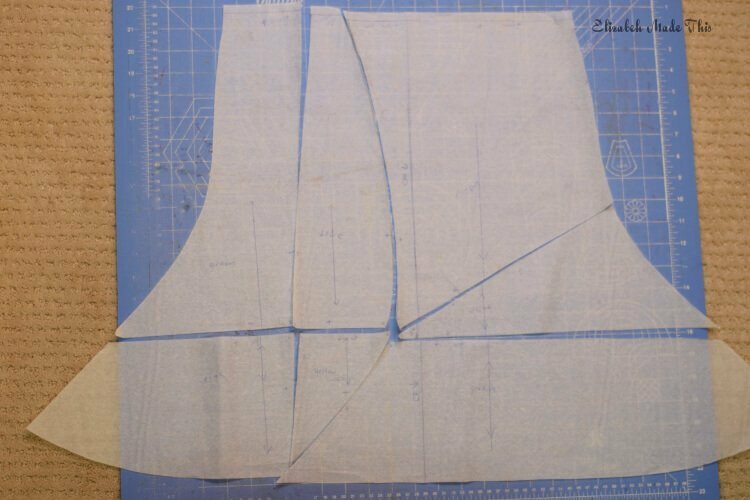 Measure that line minus the side seam allowances. This length is the length of zipper you need. You can use zipper by the yard or a closed end zipper. The Philip Lim top uses a 2 way zipper which also works. Whatever you choose, use a metal zipper. This is an exposed treatment, and you won’t like the look of a nylon or plastic zip, plus you need steam and heat to set the zip in place. Metal can take the heat! The sewing preparation for the zipper is a bit like a welt pocket. You sew a long window into place that’ll sit behind the zipper so that when it’s open it’ll still have a clean inside finish. I used fusible interfacing sewn wrong side up so that when it’s pressed to the inside it fuses in place to make a clean edge. You could just sew the zipper unit into place and slash behind the zipper, but it’ll be pretty messy under the zipper and the fabric could become unstable. I’m really happy with how the inside finish worked out, and I’m hoping the video shows it well. I did not sew the window the entire length of the zipper because I found in my practice that the cold shoulder had a spot where it draped well. Past that point, it just looked like a big old zipper was hanging off me. That magic point for me was 3.5″ down the back from the shoulder. The window doesn’t go all the way to the bottom of the front armscye either for the same reason. The window stops 6.5″ down from the shoulder along the placement line. You could put a zipper stop at the end of the back part of the opening, but I’ve found in wearing the top that it’s not necessary. The zipper does not want to go past the end of the opening. I cut four 2″ strips 2x the length of the zipper. Next, I sewed a gathering stitch along one edge. Then I gathered the strips so that they matched the length of the zipper. I applied Steam-A-Seam to the front side and back sides of the zipper on all sides of the teeth (so 4 strips of Steam-A-Seam per zipper). After the SAS was taken off on the topside of the zipper, I applied the ruffles to either side and steamed them down to activate SAS’s glue. Then you stitch down the ruffles. You can remove the gathering stitches at this point, but it’s not necessary. When the neckline and arm bindings were sewn on, I could add the zipper. Once the window is sewn and pressed back, I matched the back of the zipper teeth to the window and fused it in place. The zipper should open towards the back, and I started the pull at the front side seam allowance. The you sew down the tape to the tank. I chose to sew in the zipper flat which required me to sew the ends of the zipper before I sewed the side seams. Alternatively, you can finish the tank, then you can sew the ends together first and then sew it it in in the round. In the round it’ll be a little harder to get the zipper teeth into place. Either way works and both have their advantages! I love this hack for the drama you get with the zippers. You can go soft and romantic zipped up or more trendy zipped down. It’s also always nice to have a garment that can be worn multiple ways. Zipped up could take you to work, and zipped down would be a great top for a nice dinner out. Or wear it halfsies because you can. So what do you think? Please visit mahlicadesigns for more pictures and details on her version, then place your vote for Who Made It Best. The poll will be on both sites, so you can see both versions before you choose your favorite. Voting will be open for one week. Now that you’ve read about my Colors of Flags Challenge makes, check out Episode #2 of Pattern Hacker. 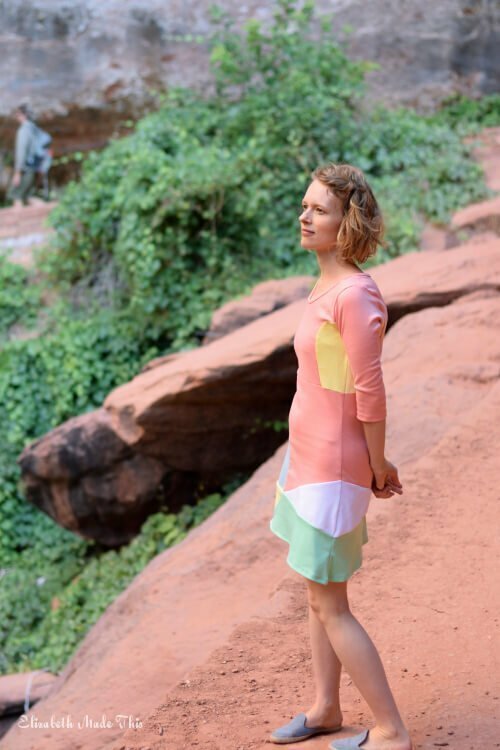 You can see my full process for this DIY One Shoulder Ruffle Dress. I’m slowly working the kinks out of my videos and looking forward to more of these types of videos. I’ve really enjoyed producing all of these for everyone! The teacher in me is jumping around! 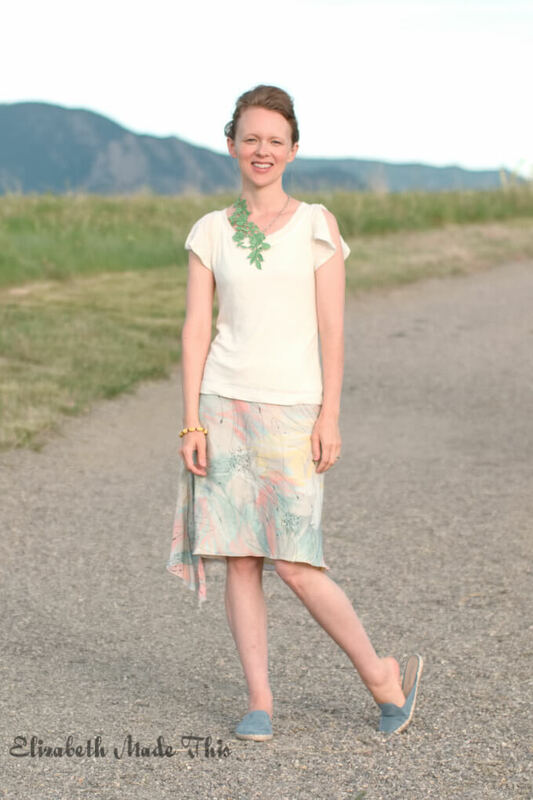 If you’re looking to make your own version of this dress and you don’t have the two Burdastyle patterns I used (5-2010-130, and 2-2013-109), here’s some ideas: Substitute any pencil skirt pattern made with stretch woven fabrics for the bottom. 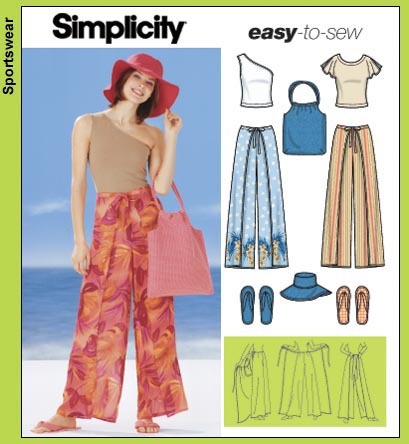 For the top part OOP Simplicity 5508 would be a great substitute. All it needs is a strap and the ruffle! Vogue 1452 could also be a good substitute for the top part. Actually, Vogue 1452 is a great substitute because the pattern has a strap, and the sloping neckline already goes all the way around the front and back. All you’d have to do is add the neck ruffle and possibly change the construction for the strap. Let me know what kinds of pattern hacks are the most interesting to you! Now go watch some fireworks! When Renata announced the Colors of Flags Challenge, I knew I wanted to participate. Not only do I really admire Renata and want to support her, the 4th of July is probably my favorite non-religious holiday. How can you not love a holiday that combines fireworks with BBQs and drippy ice cream sandwiches? Plus Rachel’s ‘Murica dress died recently…one of my favorites of hers. It was time to step up to the plate and be unashamedly, semi-obnoxiously American. My first idea was to do a red, white, and blue version of YSL’s iconic Mondrian dress. The problem with this idea is that I’d have made it in ponte knit. Ponte in December is a brilliant idea. July, on the other hand is not the month you trot out your ponte knit fabric. Red is not a color I wear on a regular basis, so I didn’t want to put a lot of money into something I wouldn’t wear a lot. Kismet found me at the thrift store and I walked away with a red and ivory Gap t-shirt, and some Dana Buchman navy stretch woven capris with white anchors. Immediately, I knew what had to happen. So that’s pretty much exactly what I wanted to make. For my version, I started with Burdastyle 2-2013-109 (asymmetric top) which I decided to pair with Burdastyle 5-2010-130 (pencil skirt). I tried on the top and tucked it into the skirt, marking the junction with pins. On the top pattern, I added 1″ below that line for seam allowance and any oops allowance I might need. It turns out I needed the oops allowance because that 1″ with 3/8″ taken out for the seam allowance was just where I wanted the waist to be. The asymmetric top has one shoulder that’s a regular sleeveless armhole. The other side has a piece of fabric that wraps around from the back to the front to create a sleeve that attaches to the front neckline. To get the one shoulder look, I copied the front neckline to the back. I copied the armscye of my favorite t-shirt pattern to finish the sleeveless armhole side. To add the ruffle, I measured the circumference of the front and the back neckline and multiplied x 2. I gathered and basted the ruffle to the top of the front and back after I sewed the side seams. 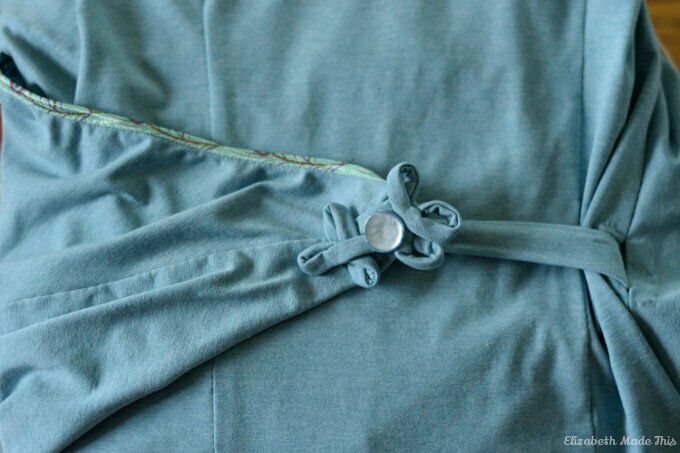 In my practice dress, I bound the edge with foldover elastic. On my Colors of Flags dress, I opted for clear elastic inside a casing. I prefer the feel of the foldover elastic, but the casing is ultimately less bulky at the neck edge. The FOE is really struggling in places to cover all of the gathering of the ruffle. After constructing the bodice, I knew I wanted to add a strap. The elastic in the casing makes it nearly impossible for the dress to fall down, but it’s always my preference to wear regular bras with summer styles. On the practice version, I cut it a little longer so that it scrunches over the elastic that I put inside the strap. On the patriotic version, I cut the elastic and the strap the same length for a clean look. The skirt is made as is with no alterations to the pattern other than eliminating the front fly. The knit bodice is sandwiched in between the front and inside waistbands for a clean finish inside. The Lilly Pulitzer dress apparently does not have a zipper as , so I went forward with the practice dress without putting in a zipper in the blue/floral version. This was a mistake. The skirt fabric has no give and it’s already a pretty fitted style. Do you have those dresses you have to do weird yoga to get into? This is one of them. The patriotic dress sports a side invisible zipper which is such a better idea. Other than that, I used that pretty combed cotton plaid in the IG picture above for button downs for my guys. All the patterns are the same Ottobre patterns I used here. If you haven’t already, go check out more about the Colors of Flags Challenge on Instagram #flagsoftheworlddressproject#colorsofflagchallenge #4thofjulyprouddressproject. 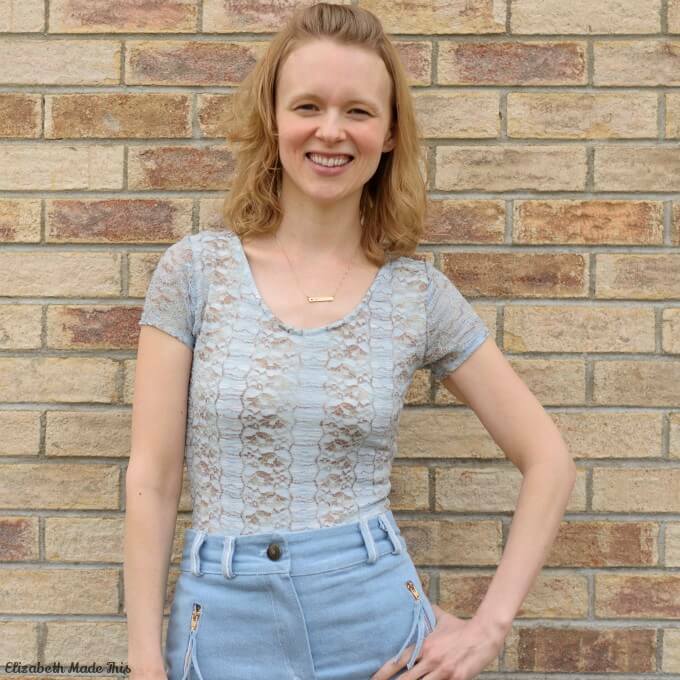 There’s still time to share your outfit through your blog, IG, or YouTube(until July 7th) for a chance to win some great prizes available from Sewing and Design School, LA Finch Fabrics, and Dressy Talk Patterns. I went and done it. I took my first plunge down the deep rabbit hole of Elizabeth Made This’ YouTube channel. Producing took way longer than I expected it to, but my first official video is now up! 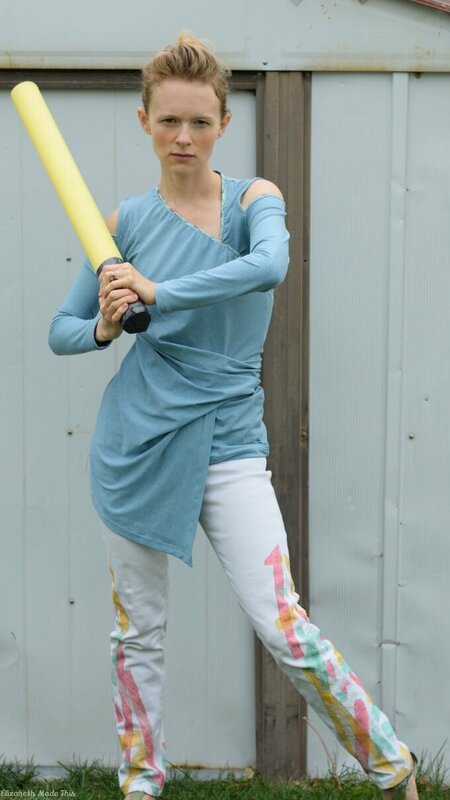 I hope you enjoy this split flutter sleeve tee pattern hack tutorial. For the sharp ears, you can enjoy my kids’ laughter in the background! I’d love to see your own versions of this top! If you follow this tutorial through, please show it off! Drop me a line here or you can tag me on Instagram @elizabethmadethis or on my Elizabeth Made This Facebook page. All of my t-shirts have been slowly wearing out, so at the moment, I have t-shirts on the brain. You know what that means, right? It’s time to dust off my Pinterest boards and get to hacking. 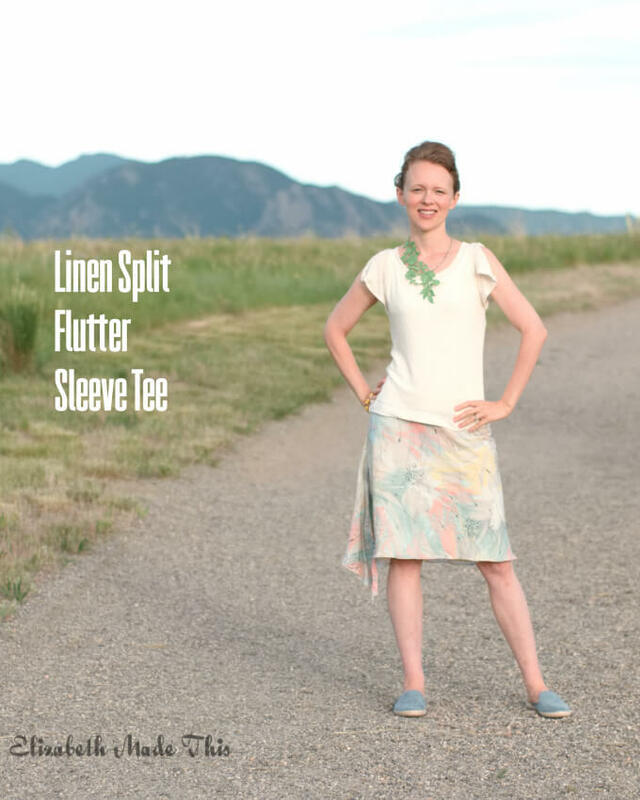 This linen split flutter sleeve tee started as a search for something to do with linen knit, and it’s become one of my favorite hacks I’ve ever done. It’s a simple hack, but I think it’s really effective, plus it has a Romantic sort of style that’s airy and perfect for summer. I’m so excited about this, that I decided to dive headlong into the notion of video tutorials. I’m working on editing a video featuring a tutorial for this top. Look for it here on Thursday! I went searching for linen tees, and this J Crew one was one of the first that popped up. I love the idea of a flutter sleeve. The J Crew sleeve is constructed much differently than what I settled on, but I like the overall effect. 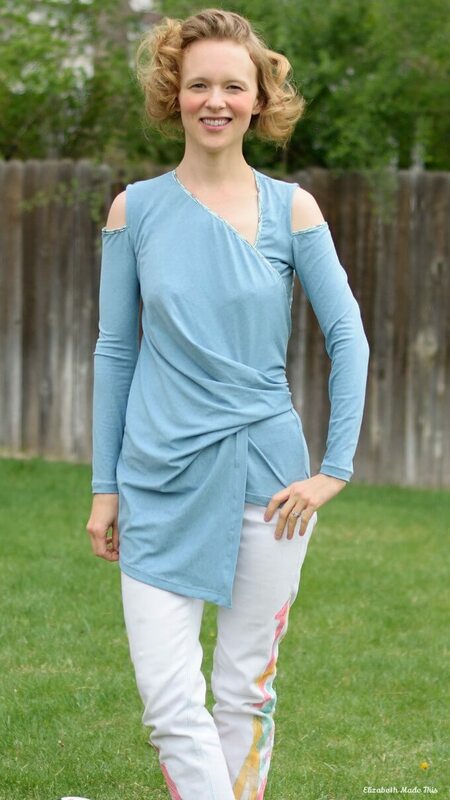 I chose to change up my sleeve like this Whistles’ top but with an added split in the sleeve. I chose to start with Straight Stitch Design’s Greenwood Tank. I like the shoulder width on this tank, and after I altered it to have the same armhole as my favorite Jalie 2921 tee, it’s become a favorite tank pattern. Because it has the same armhole as the Jalie tee, I can freely pop in Jalie sleeves. For this tee, I started with the cap sleeve from the Jalie 2921. A few quick changes, and the cap became a flutter sleeve with a split. I have a couple of linen knits in my stash that I’ve been saving. Linen is my #1 favorite summer fiber to work with, and when I started seeing linen knits pop up in RTW stores like Madewell and J Crew a few years back, I decided to try and find some of my own linen knits. I’ve picked up mine from Fabric Mart and Cali Fabrics‘ San Francisco store, but I know I’ve seen them at Harts’ Fabric and Mood. What’s lovely about linen knit is the breathability. It’s so light, and I daresay that it’d still remain cool in the sweatiest of summer climes. There are a couple of drawbacks to linen knit. They’re sheer. You’re either lining this, wearing a cami, or showing more than is advisable. They don’t recover well. This fabric does not bounce back well. It’ll require special handling and good pattern choice so that it doesn’t stretch out into a pile of falling off your shoulders. The lining that I added helped with both of these problems. I can wear the tee without worry of showing too much, and the lining fabric (a very bouncy poly spandex with superhero recovery) helps support the linen. I opted for a simpler neckline finish than the Greenwood. In the original pattern, the folded bindings are stitched on, then flipped over the stitch line and stitched down. It makes for a really clean finish, but again, I wanted to avoid overworking the linen. As it was, I had to baste the binding on 3 times because it was too long and kept stretching out more every time I touched it. Once I got the correct length, I stitched the folded binding just once, serged the raw edge and then stitched it down below the neck seam. Watch this space for the video tutorial on this top! Have you sewn with linen knits before? How did it go? 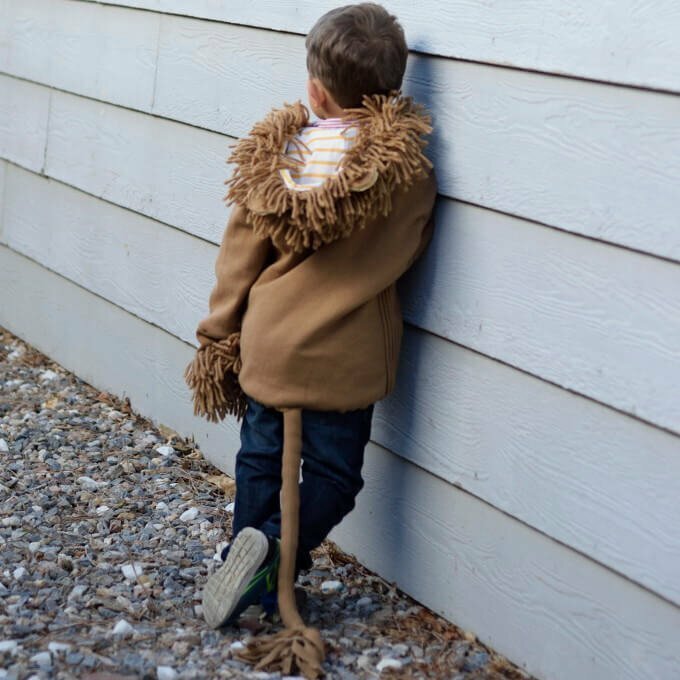 This diy lion hoodie and Very Shannon Sally dress are two of the projects I’ve made for my kids of late. The dress was for Easter, though I’m just getting around to writing it up now, and the lion hoodie is the result of a challenge a sewing friend gave me. One of the women that I sew with monthly had this beautiful brown knit jacket. It’s by a better knitwear designer that you’d buy at Nordstrom, so I’m going to venture a guess that she originally spent a fair amount on it. It features this elaborate wool yarn trim on the collar and the cuffs. J is in the process of a home remodel and in need of downsizing her closet. 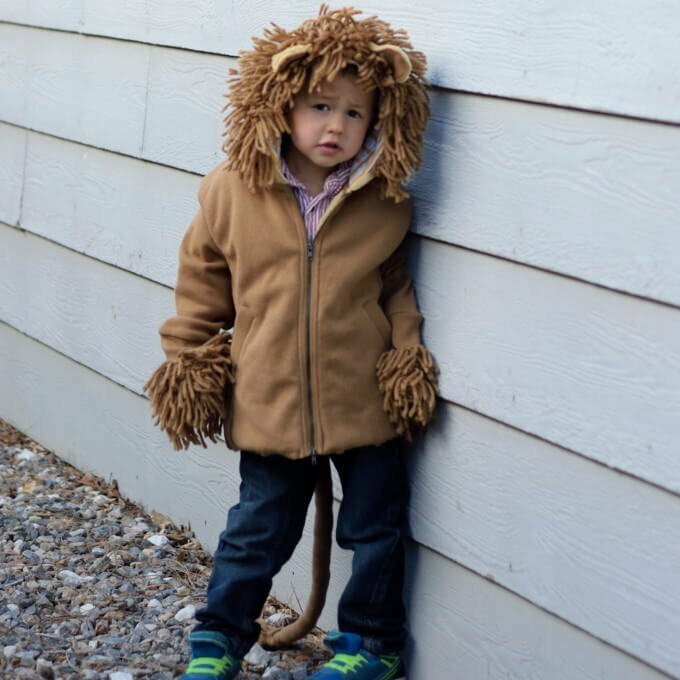 She remembered this jacket and challenged me to make a lion costume out of it for my kids. My boys generally go around the house roaring at people, so it seemed a natural project for me. 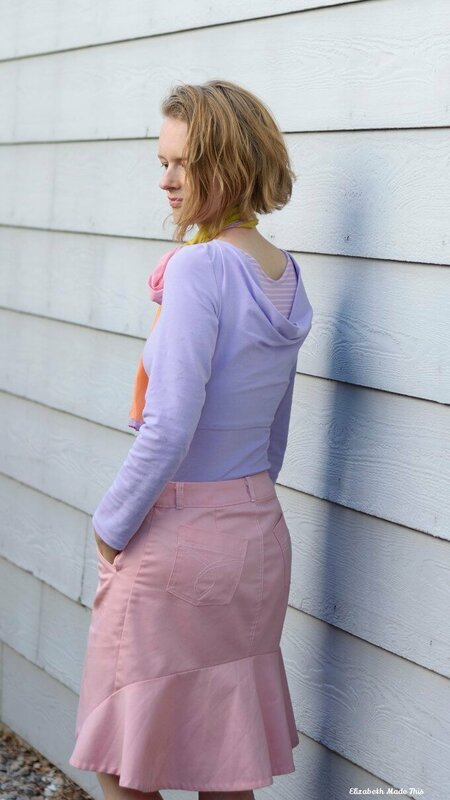 I pulled out an old Ottobre and found a basic hoodie pattern to start my refashion. This is 6-2009-8. It’s a basic zipped, lined hoodie. The biggest size was a 92, and my son needed a 98, so I graded it up. I was able to save the old zipper. One of the things I really enjoy about refashion projects is that they force you to be creative with your materials. The collar became the tail, and all the outer jacket pieces were easily cut from the original jacket. The zipper facing became a neck seam binding, and I used scraps from the sleeve to make the fringe on the tail. To make the jacket a little more wearable and a little less costumey, I opted to line it with a patterned knit. I found a nice turmeric striped XL rtw tee while thrifting. Just the sleeves were used for the hood because I wanted to have enough leftover to make this tank. I lucked out in trying to find the right faux fur to line the inside of the jacket. A golden wheat minky blanket found its way to me on the same thrift trip that produced the striped tee. I say minky because I’m not really sure what it is. It’s not precisely faux fur, it’s not really minky, but it is soft and cuddly and very warm. I bagged the jacket, but I left the sleeves unlined. The jacket is knitted, so it has a machine finished edge. Because I was dealing with heavier materials, I kept this edge as the bottom of the jacket and hand sewed the lining rather than turn up a hem. I couldn’t resist adding some fun to the welt pockets in the way of squirrels on the inside. 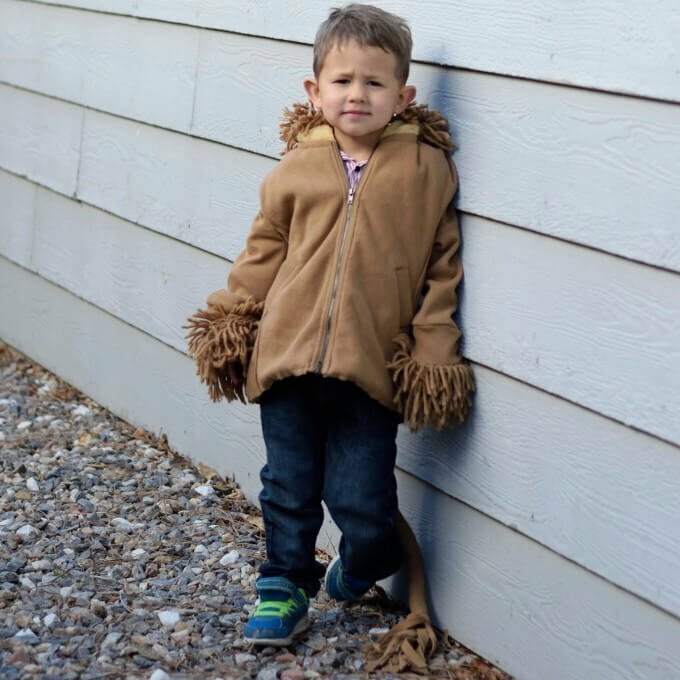 The trim for the mane was sewn onto the original jacket with little hand overcast stitches, so it was really easy to deconstruct. The used all of the trim from the collar on the top of the hood, centering the trim with the CB of the hood. Zigzag stitches hold it down flat. I also made ears for the top of the hoodie from the blanket. 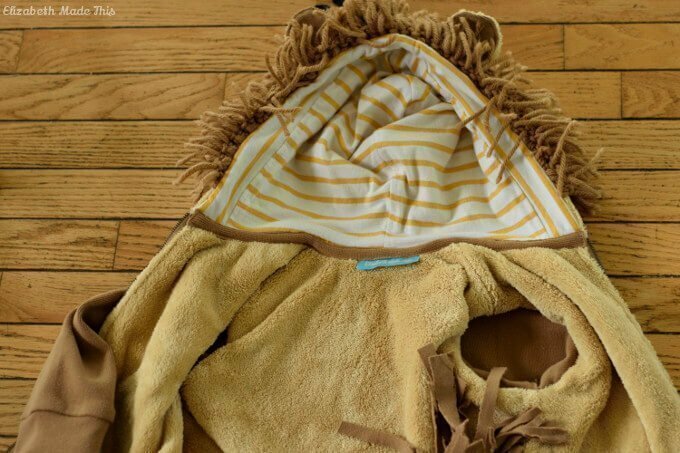 The ears are sandwiched between the lion trim and the hood seam. Rather than disassemble the trim for the sleeves, I treated them as cuffs. They’re not as fitted as a normal sleeve would be, but they were much easier to deal with. 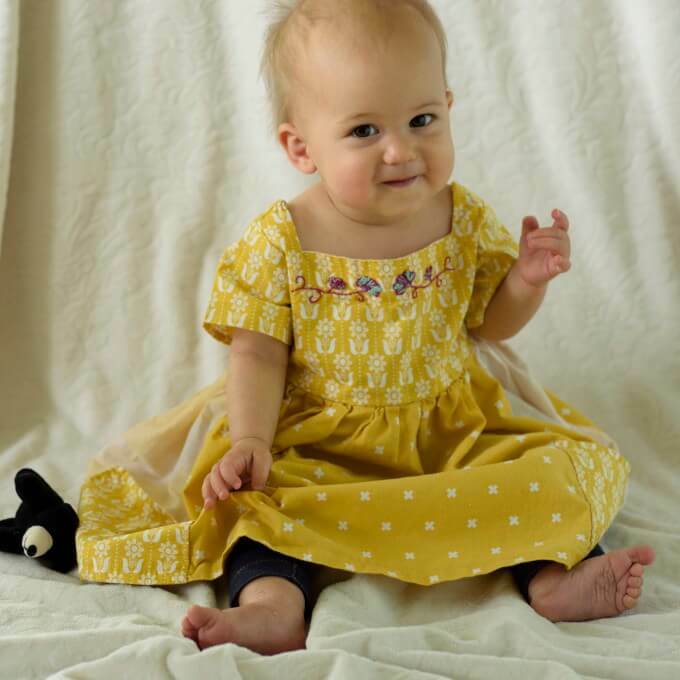 This was the first year that I got to make an Easter dress for my daughter! She has a little friend who’s just a month younger than her whose mom gifted me with Very Shannon’s Sally Dress. She had hoped to make it for her daughter, and it was really sweet of her to think of me. 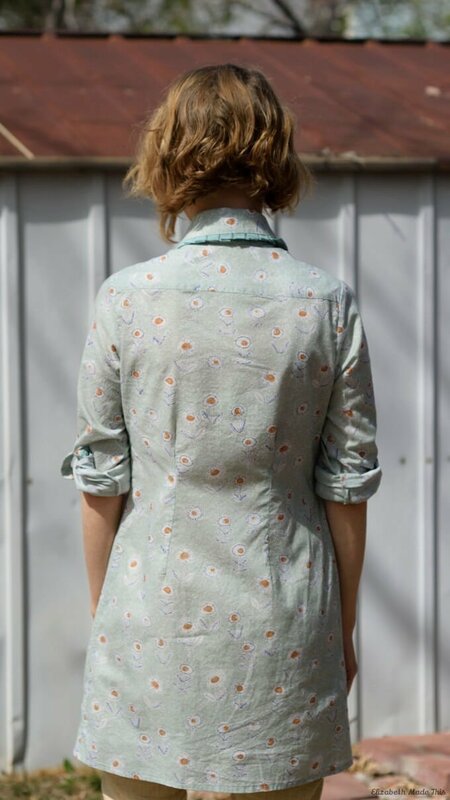 I sewed mine up in some bits of Cotton + Steel fabrics I had from Hawthorne Fabrics. The skirt piece was too big for my narrower fabric, so I added a panel of white/yellow voile on the sides. This pattern has got some really cute features. 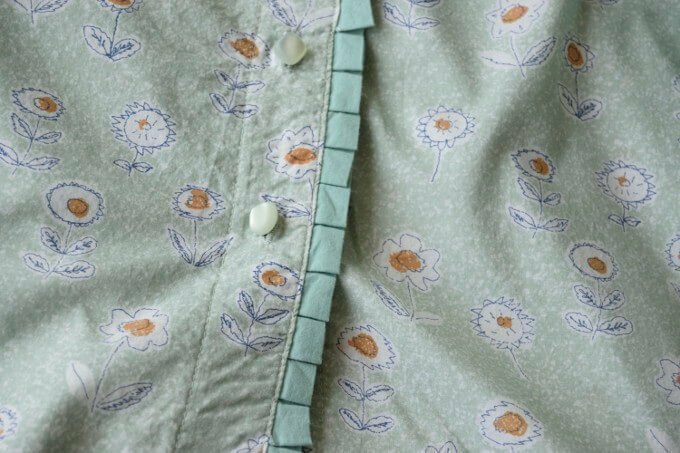 There’s big pockets on the sides of the gathered skirt and there’s a sweet square neckline. The smallest size is a 2T, so I graded it down a size. I do have an issue with the neckline. The front is the same as the back, so it doesn’t fit on the shoulders the greatest. Also, the shoulder seam comes to a weird point at the neckline edge. You can see that weird point on some of the modeled photos on the Very Shannon site. Weird neckline point aside, this is a good pattern for beginners. There’s clear instructions that are unbelievably detailed. You can’t mess this one up. I know my friend is anxious about having to sew zippers or buttons. She was excited to find a pattern that just fits over baby’s head without fuss. It’ll be a great pattern for her. Plus, the overall cute factor of this dress makes up for my annoyance over the fit. I had a good time adding some extra embroidery too. 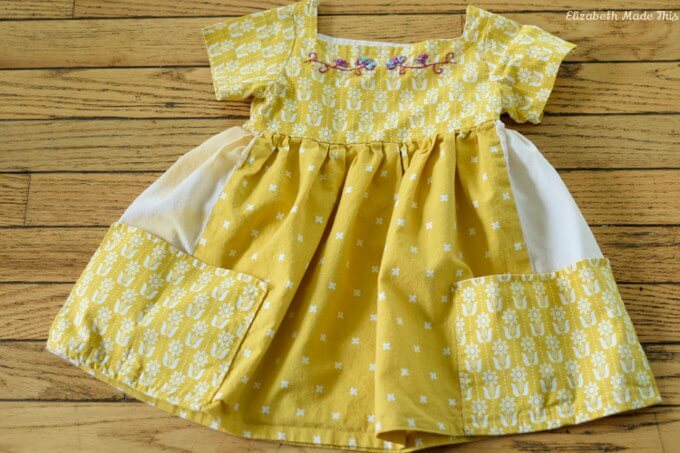 I won’t be sewing it again, but my daughter loves it, so it’s a win. I’m wrapping up my Wardrobe Sudoku makes, and I’m saving the best for last. Today, let me introduce you to this Pleated Trim Tunic Dress. If you remember one of my #2017makenine was this shirtdress/tunic from MyImage. Well, I did a muslin of that pattern, and it was an utter disaster. Somebody commented on my Instagram that her experience with MyImage is that they’re drafted for tall Dutch people. Being neither tall nor Dutch, all I can say is that the armpit was halfway down my torso. So I scrapped that in favor of something that I knew would work, namely Ottobre. 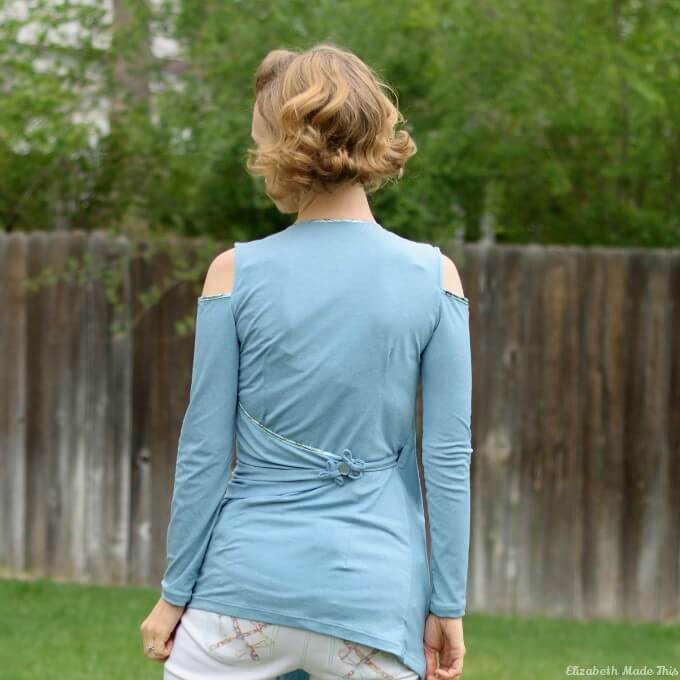 With a base pattern in place, I knew it would be easy to grab the style details from the MyImage tunic. If you remember one of my #2017makenine was this shirtdress/tunic from MyImage. Well, I did a muslin of that pattern, and it was an utter disaster. Somebody commented on my Instagram that her experience with MyImage is that they’re drafted for tall Dutch people. Being neither tall nor Dutch, all I can say is that the armpit was halfway down my torso. I looked like a little girl wearing her Daddy’s shirt. So I scrapped that in favor of something that I knew would work, namely Ottobre. 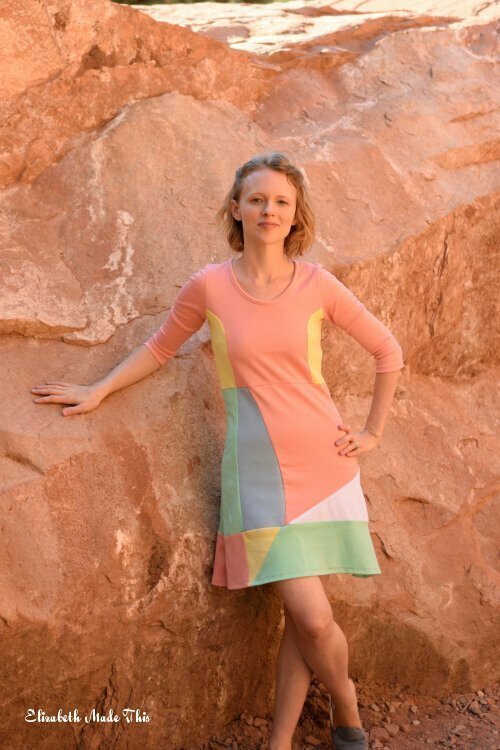 With a base pattern in place, I knew it would be easy to grab the style details from the MyImage tunic. Ottobre 5-2007-15 is a longer version of Ottobre 5-2007-2 shirt that I’ve made multiple times in various forms. It’s meant to be worn as a unstructured jacket, so I did a little (or a lot) of monkeying about to make it into a shirtdress. Back: I rotated out the shoulder darts and converted them into a back yoke. I think yokes look way better and they make for a cleaner inside finish. Because of my limited fabric, the yokes and collar stands are cut on the crossgrain. Fronts: The original pattern has a wide facing, but I opted for just button bands. I knew I’d be adding a collar stand, so there was no need for a facing that extended up into the shoulder. This was also a much needed fabric saver solution. Darts: The shirt as is too boxy for me in the waist, so I draped out vertical darts in the front and the back. I really wish that the original pattern had these included in them. You could borrow the darts from the tops except that they sit a little too low. Sleeves: I added cuffs with pleats in the sleeve bottom. Collar: I never really liked the collar without a stand on the original top. I altered a collar stand from another pattern that didn’t work out for me to fit the neckline of this pattern. Pockets: I added pockets on the fronts. 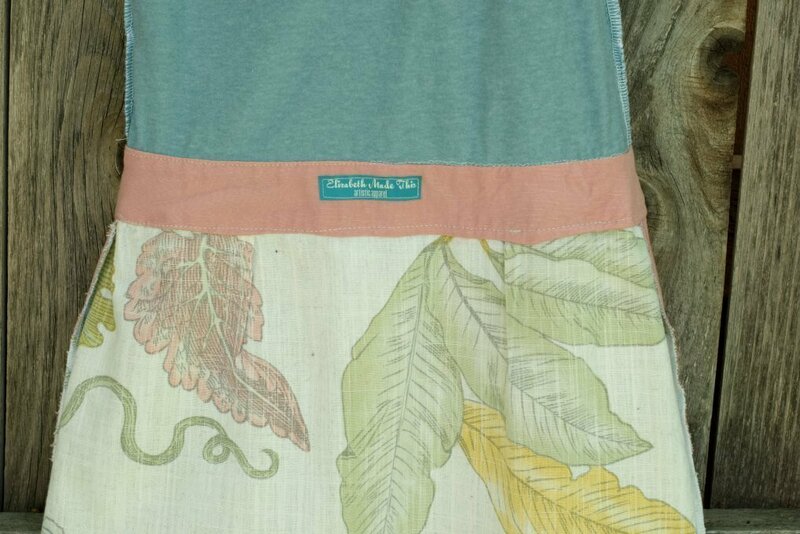 The fabric for the cuffs, pockets, and trim comes from scraps of the embroidered voile leftover from this skirt. My hope was to break up the print a little with the voile. The shape of the pocket I borrowed from another Ottobre pattern in the same issue. 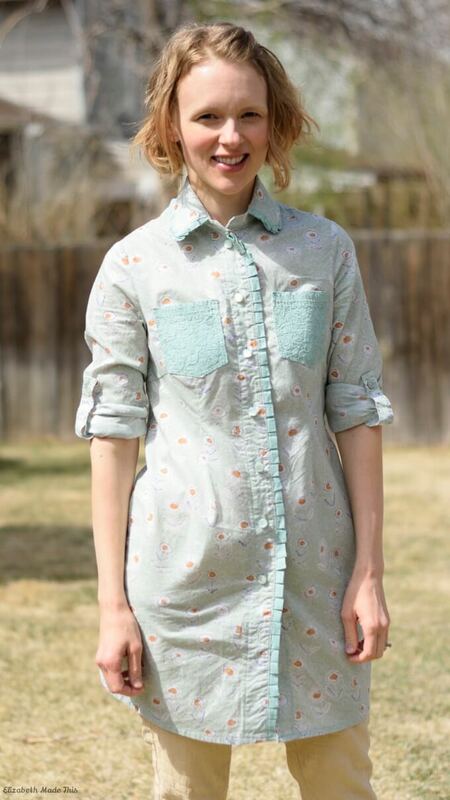 Button tabs: The MyImage tunic has button tabs that hide under the full length of the sleeve. When you go to cuff the tunic, the tabs wrap around the cuff and fasten with a button above it. You really don’t need any kind of a pattern piece for this. Just cut a rectangle 2.5″ wide by however long you want. Interface half of it lengthwise, bring WST and stitch around 1 short end and the long side, turn and topstitch. Finish it with a buttonhole and sew it on the wrong side of the sleeve where you want it to fasten. The exact placement you’ll probably have to fiddle around with a little. The square shank buttons I used along the placket were too bulky for the sleeve tabs (I had buttons growing out of my arms! ), so I opted for flatter plain shirt buttons on the button tabs. The pleated trim–my favorite part! The collar, right front and cuffs are trimmed with pleated trim I made from the unembroidered selvedge edges of the voile. (there was just over 6″ of plain fabric on both sides of the selvedge). I saw a random Facebook video showing the technique and immediately knew I’d incorporate the trim into this top (I’m not sure where I saw the video, but there’s tons of YouTube videos on fork pleating and also web tutorials). A small cocktail fork became my measuring device for the pleats. With limited fabric, I went for the cocktail fork over a larger fork because it makes shorter pleats. I also made pleated trim for the cuffs from the cotton lawn. The trim is basted into place between the seams just like you would do for piping. Rounding the corners with the pleats is the only tricky part. The length of the pleats made for some not so pretty corners on the collars. After a lot of unpicking, I folded in pleats just to round the corner. It’s not perfect, but I’m happy with the end result. I am happy that the trim running down the center is just right. That strong vertical line that I was hoping to create with the trim is right where I wanted it to be. Stay tuned tomorrow for my denim jacket! It’s been a project that got shelved for a long time, and I’m glad I finally made the time to sew it up. It was 4th grade and my friend Paola was the height of cool. Not only was she from Mexico and a gymnast who trained with Bela Karoyli, but she wore leotards nearly everyday to school. She always looked so strong as she was back handspringing her way around the playground. Better yet, those leotards never came untucked like regular shirts. While I never had my own stash of Capezio bodysuits to my name, I never forgot how polished Paola always looked in her leotards. I finally decided it was high time for me to sew my own. 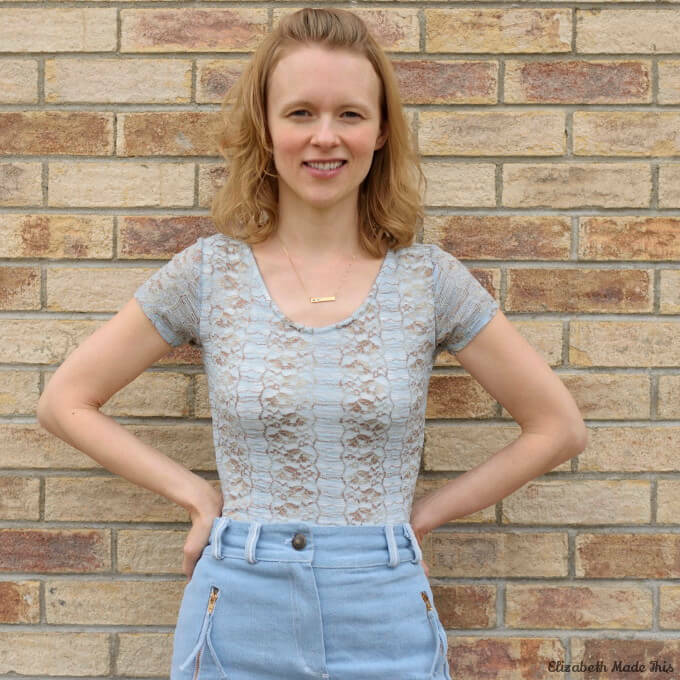 Here is my lace bodysuit from Jalie’s Bella Dress pattern. 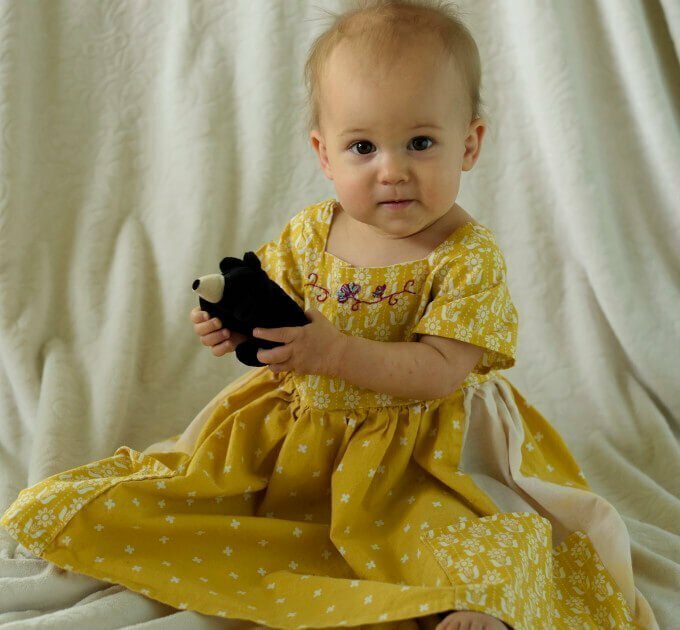 Did you know that Jalie’s Bella Dress has a leotard pattern in it? Neither did I until I started making my night look for the Day and Night Dress Challenge. It’s actually a brilliant little piece of pattern work on Jalie’s part. The dress with its giant flared skirt and no waist seam would be very, very bulky were it to be fully lined. The leotard provides opacity for thinner knits if needed and it lets you twirl away without fear of flashing. And the leotard adds no additional bulk. 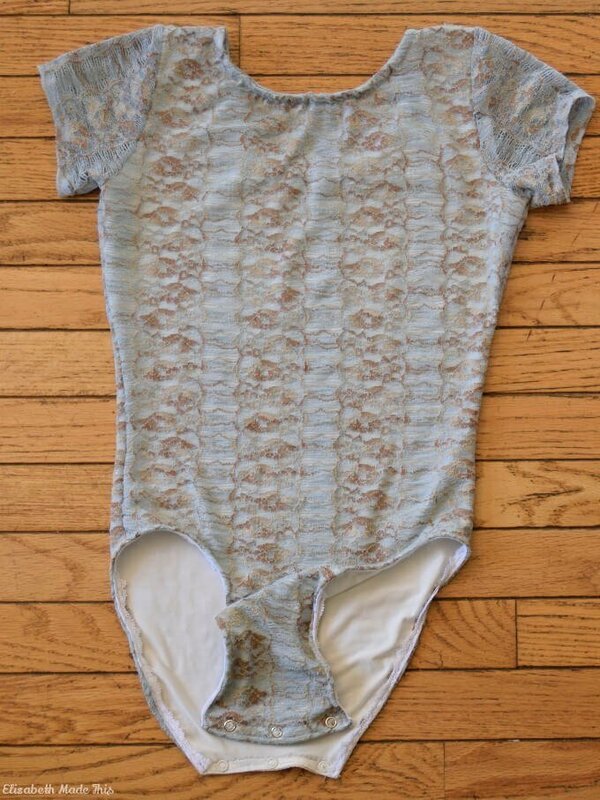 I had gone back and forth about buying Closet Case Patterns’ Nettie Bodysuit for an absurdly long time. I held back because of my last pregnancy and also because I wasn’t sure about the fit. When I found the leotard pattern, it might has well have been Christmas in my sewing room. I know Jalie’s fit really well, and more importantly, they fit me really well. Below, I’ll show you how I adapted the leotard to add snaps, but I also changed the neckline. The leotard for this pattern is meant to be a lining, so the neckline is quite low so it doesn’t peek above the dress’ neckline. Because I liked where the dress’ neckline sat in front and in back (after I raised it in my dress), I traced the front and back neckline and added it onto the leotard pattern. It raises the front by a hair and the back by quite a bit. This makes for a bodysuit that I’ll actually feel comfortable wearing. 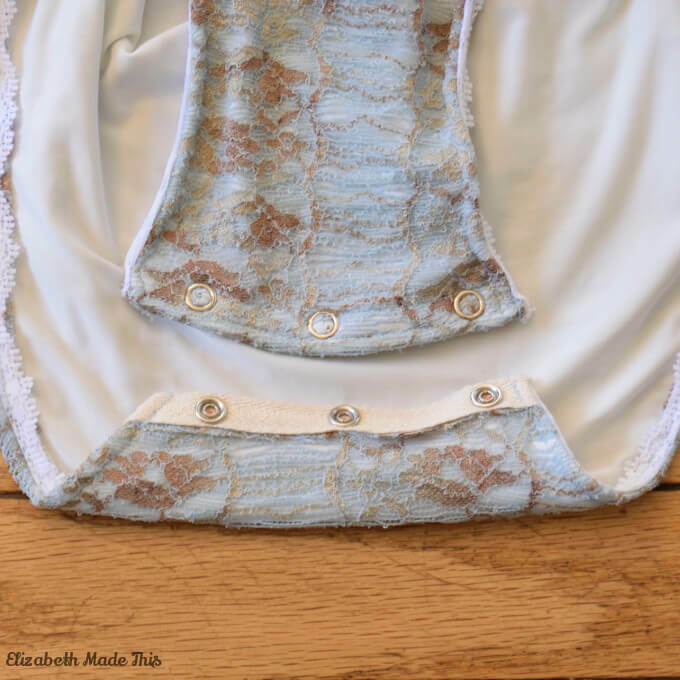 The lady cutting this pretty blue stretch lace gave me a look of disbelief when I said I was going to make it into a bodysuit. Lauren had inspired me, and I’m no stranger to lace. To make the lace wearable in public, I decided to underline it. After cutting the lace out, I laid the front and back onto yardage of my favorite white poly/spandex knit. I picked up yards and yards of this stuff at Michael Levine’s Loft a couple years ago. I will be very sad when I run out of it. It’s springy, drapey, smooth, lightweight, and yet opaque. It’s basically the perfect lining. I set pattern weights around each lace piece and hand basted the lace to the poly/spandex. 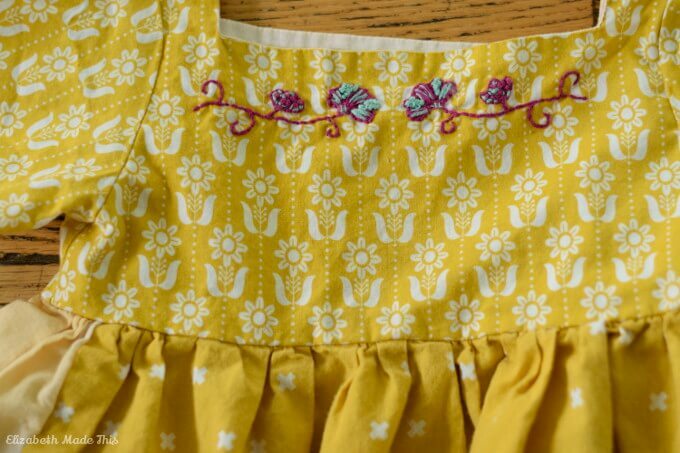 When you underline, it’s not a bad idea to use a different length of thread along every edge of the pattern piece. This way, you can pull out basting thread as you go without having to worry if you’re going to pull out all of your basting stitches. I cut out the spandex around the lace after the edges were secured with the basting stitches. After this, you just treat the lace/lining layer as one. It’s a bit of work at the beginning, but underlining is lightning fast once you get to construction. Jalie offers no binding piece or length of elastic for the neckline. I simply sewed a crossgrain strip of lace folded in half by width to the right side of the neckline. Then I flipped it to the inside and stitched it down. I will mention that I only sewed one shoulder seam at this point. Often, I sew neck bindings like this. You want to stretch the binding strip just slightly. If you stretch too much, you’ll get puckers, and if you don’t stretch enough, the binding won’t sit flat on your neck. With a little practice, you’ll teach your hands exactly how much stretch there needs to be and you’ll never have to measure neck bindings. After this, sew up the other shoulder seam and stitch down the ends of the binding to the neckline. This is news to me, but I guess leotards generally don’t have snaps for restroom purposes. It sure makes sense now why they always have big neck openings. With a small neck opening, there’s no chance you have of getting your legs through the leg holes. Personally, I don’t want to get fully undressed when visiting the ladies’ room. So, how do we fix it? Add length to the torso: I found I needed 1″ extra length in my torso to accommodate the snap closure. Without the extra space, your bodysuit will be quite tight around that area. A muslin will help determine precisely how much length you’ll need. Press back seam allowances: at the crotch seam, fold back the seam allowances and press. With my slippy fabric, I used Steam-A-Seam to hold them down. I used twill tape to cover the seam allowances. The twill tape is a nice and stable base for the snaps. Snap tape would also do the trick. You can also finish the seam allowances with a lightweight fabric like Heather suggests in the Nettie sewalong. Add the snaps: if you’re using snap tape, just sew the tape into place on top of your pressed seam allowances. A zipper foot lets you sew right at the edge of the tape without having to navigate around the snaps. If you use twill tape or lightweight fabric, add the snaps manually. For this bodysuit, I used my Snap Source setter. Finish the leg openings: I chose to set the snaps and then finish the leg openings. You could finish the legs first then set the snaps too. Choose your own adventure. This is my item #5 for Wardrobe Sudoku. At this point, I’ve finished 9 items! I wanted this bodysuit to be a wardrobe workhorse, and the contest gives me a chance to think about basics like this one and put them into use. I really like it with my denim skirt and my Designer Stitch Alyse slim leg pants. Look out for more about the Alyse pants on Tuesday. At the end of the day, I really love this style, and I will be making many many more of these bodysuits. Not having bodysuits in my closet just might be the reason I haven’t worn skirts as much as I’d like to. I’d like to think that Paola would approve.